Snubbr, a site that let’s you ask any question and have it answered by experts, asked if they could write a guest post about the best Vegan cookbooks for your Dad. Your Dad isn’t a vegan? Mine either. But cutting down on animal products (and his cholesterol) will protect his sweet heart. Maybe present the cookbook over a delicious, home-cooked vegan meal? Have cookbooks to recommend? Let me know! If you happen to have a vegan father (or husband) and are looking for a gift for the upcoming Father’s Day holiday, considering a vegan cookbook is one of the best ideas you could get for him. One of the greatest challenges of being a vegan is constantly coming up with new ways to prepare your food while sticking with this diet, so he’ll definitely appreciate the book and make great use of it. Be sure that you browse around however as there are a wide variety of vegan cookbooks available to choose from. Let’s get you started by showing you our top five picks. 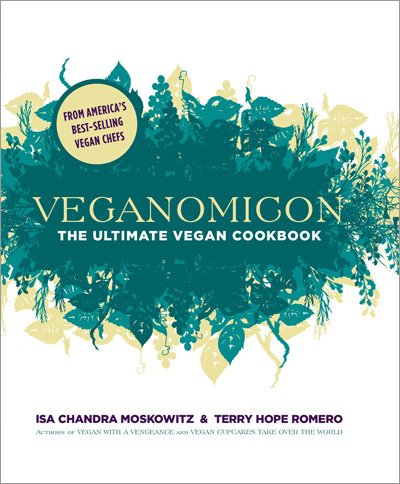 If you’re looking for the most all-inclusive vegan cookbook around, look no further than this option. It’s not only going to provide you with a number of different recipe options to choose from but it’s also going to show you how to prepare a variety of different vegan foods. If your dad doesn’t do a lot of cooking for himself on a regular basis, this is the gift to give him. The book comes with a variety of different photographs to fully illustrate what each dish will look like completely prepared so from the moment he opens it up, he’ll love what he’s seeing. If you’re looking for a low-budget cookbook that will give your dad plenty of ideas, this book can’t be beat. All of the recipes are also low in saturated fat and really pack in the fiber so with each one he prepares, you can rest assured he’s doing something positive for his health. The book is filled with 320 pages of recipes so there will be no shortage of options when he has this to be his guide. If your dad is looking for something a little different and appreciates originality with his cooking, this will be the book to get him. Best of all, every one of the recipes has a low budget in mind so he won’t break the bank while preparing these. One of the nicest things about this book is all the different dairy free dessert recipes it includes so he’s sure to find something sweet that he can enjoy. If your dad has strict orders from the doctor to watch his cholesterol level this will be a good cookbook choice to get him. This book incorporates a wide variety of different foods and flavorings to help spice up meal time from Asian and Indian spices to various natural nut butters. The recipes in this book are very easy to follow and will be appreciated by those who aren’t even vegan-style eaters. Since the book is smaller in size it’s one of the best gift-giving options around and will be greatly received by your father. If your dad appears to be tired of the everyday meals he’s so used to, this cookbook is sure to please. Included in this book are dishes from every single continent so he can expand upon his taste preferences and try some really non-traditional cuisine. Many of the dishes in this cookbook are quite spicy however, so take note of that and be sure that you warn him. If he’s enjoys the hotter tasting foods, this book will feel like a match made in heaven. The author does make notes however of how you can adjust the heat of the recipes so if he’s someone who easily gets overpowered by spicy foods, this definitely won’t rule this book out as an option for him. Being a vegan can sometimes feel like a challenge when you’re running low on ideas as for what to make but with these books the meal options become that much more plentiful as does his nutrition. If you need more gift ideas, check out snubbr.com. They’re a Q&A site for shopping advice, backed by thousands of experts. You simply ask a question, and they search for experts to answer it for you.